Consumers are always looking for ways to cut their bills and find out which product best suits their needs. As a result of this cost cutting desire, price comparison sites have become a good way to help user find the best offers available. Having a price comparison website is therefore a great way for affiliate marketers to make money. And the good news is that RevGlue offers you a simple way to add a price comparison website to your existing website domain so that you can monetise that traffic that you already have going through your site or blog. Check out the demo for yourself to see the functionality being offered. Using iframe technology, our RevEmbed tools provides an existing Broadband, TV and Phone comparison website which can be dropped straight into your existing site meaning that you can instantly start making money through a fully featured website. In eight easy steps your broadband, tv and phone price comparison site could be live. 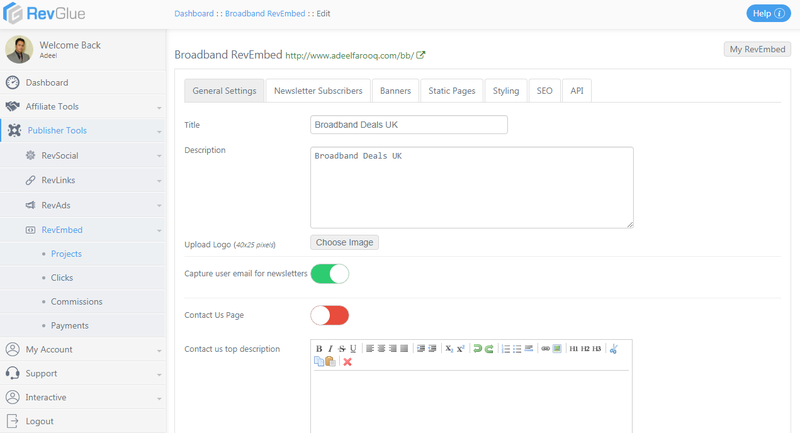 How to setup your broadband comparison website with RevEmbed? 1 - Create Free user account on RevGlue.com or login here if you are have already registered. 2 - Click on project under RevEmbed on the left main menu in the left panel or click in view button on RevEmbed box as shown below in the image. 3 - Click on Create New Project button and select Broadband UK website. Provide your domain url where you want the broadband comparison website to appear and on Add RevEmbed button. 4 - Download the index.php file that is provided to validate your domain on your server as shown in the image below. 5 - Upload the index.php file on your server in the same subfolder or sub domain that is provided in the last step with Filezilla or web ftp. 6 - Click on verify domain button on RevGlue window. If you have closed this window then you can still go back to RevEmbed projects and click on the grey icon that will validate your domain. Once validation is successful the grey check icon will turn into green icon. 7 - You can view the website status in the main RevEmbed projects page as shown below. 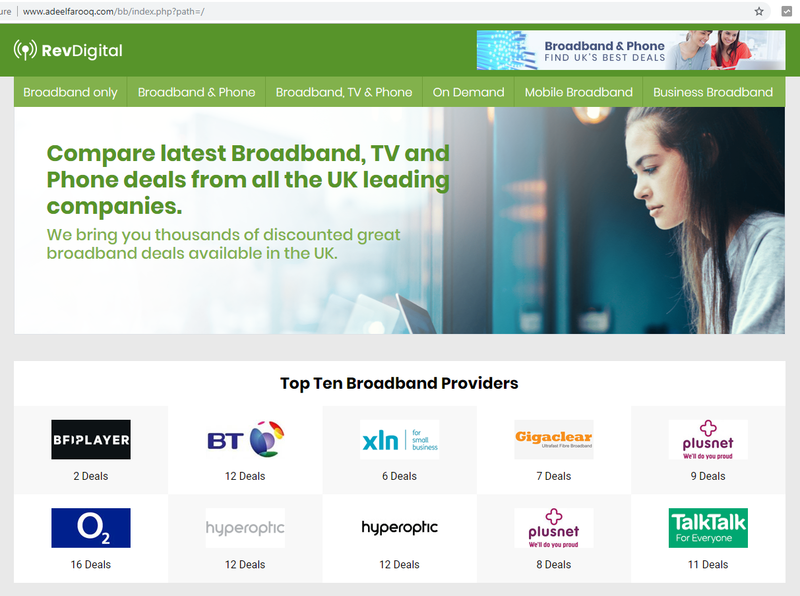 Can i customise my Broadband comparison website? Yes, RevEmbed offers several options for you to manage your Broadband UK comparison website. Click on Edit button in front of your RevEmbed project and you will be provided with multiple options to manage your Broadband comparison website. See image below. 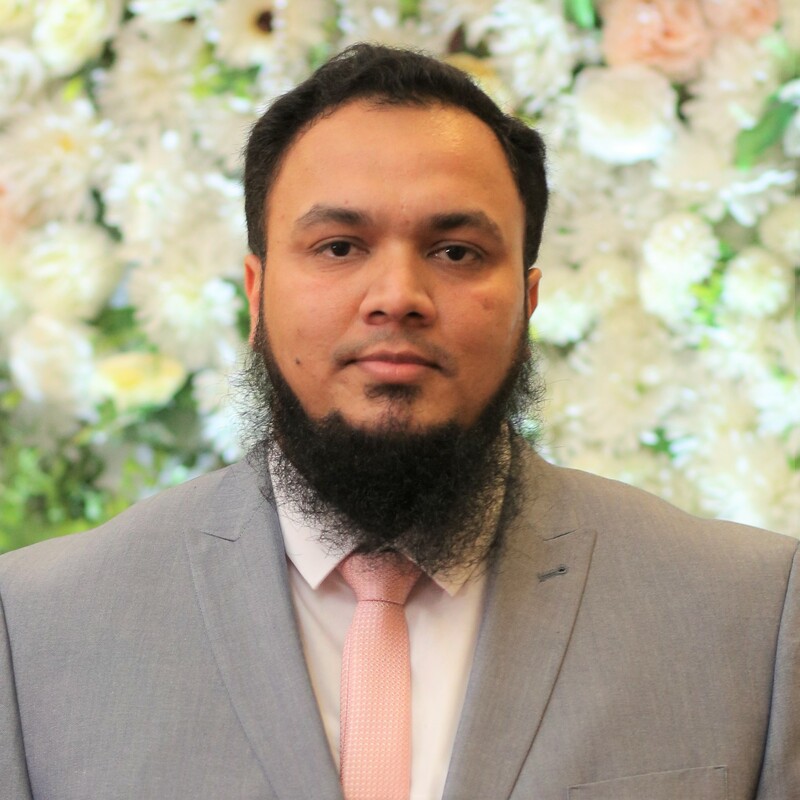 General Settings - Allows you to update your RevEmbed logo, background image, title, description and manage other basic options. Newsletter Subscribers - You can export your RevEmbed newsletter subscribers. Contact them with latest offers to bring them back on the website. These are your RevEmbed users and these are not shared with anyone. Banners - Upload your home page and other RevEmbed banners from here. Static Pages - Here you can manage static pages such as terms and conditions etc that appear in the footer section. Styling - Change your RevEmbed colour combinations easily. SEO - Write your own SEO meta tags for all core pages. API- Here you have Open API data for developers for this RevEmbed niche. This is provided on revenue share basis if developers wish to use it for their own websites or mobile apps. The data is same that is showing up in the RevEmbed website. 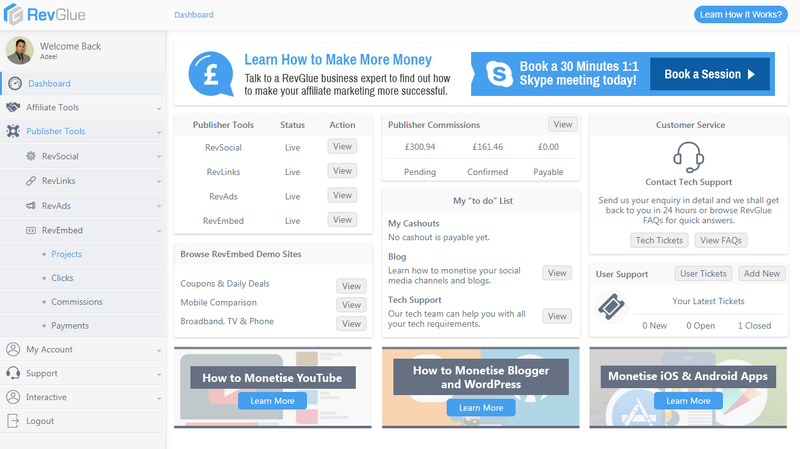 Affiliates can view detailed clicks, conversions and cashout reports in the RevEmbed menu. Browse these reports to see how your RevEmbed project is performing. 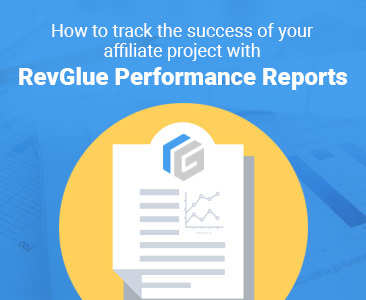 Click Report - Browse all clicks going out from your RevEmbed projects. Each click is saved and reported back to you to see who is clicking on what and what is converting well on your project. Commissions Report - Here you can view daily commissions that are generated when users are making sales from your RevEmbed project. This data is updated daily from all the participating affiliate networks. You can request your cashout once you reach £100 in payable commissions. Payments Report - Here you can view all your historical cashout history that could be paid or pending. So what are you waiting for? 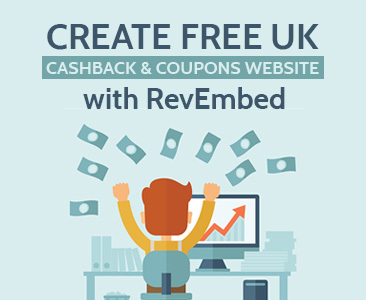 Create Free RevGlue.com account, setup UK Broadband, TV and Phone Comparison projects with RevEmbed. 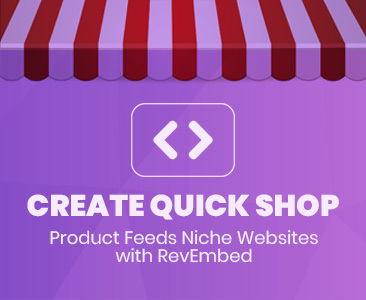 RevGlue manages design, development, data, affiliate network relations with the ecommerce stores and tracking for you. All you have to do is promote your RevEmbed project with relevant users who could convert for you and you can earn 80% commission on each sale that is provided by the ecommerce stores.